One of the roadblocks to adopting Internet of Things technology is multiple interfaces to access and monitor usage data. Each manufacturer uses their own dashboard, requiring cleaning professionals to use multiple programs. However, several industry manufacturers recently created partnerships to solve this dilemma. Kimberly-Clark Professional and GOJO Industries partnered to offer a single interface for smart restroom dispenser technology. Through this collaboration, the Kimberly-Clark Professional smart restroom management system, ONVATION, is now available on SCOTT and PURELL products. “Restrooms are consistently one of the top three areas of tenant complaints for facility managers, and they need real-time data and alerts to help them efficiently and effectively manage the restrooms for their customers,” says Richard Thorne, president of Kimberly-Clark Professional, North America. In addition, GP PRO and TOTO USA collaborated to offer the KOLO Smart Monitoring System on enMotion dispensers and EcoPower faucets and flush valves. 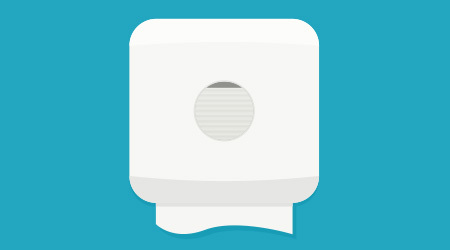 The system monitors paper and soap levels, as well as water usage to identify potential leaks and overflows. “We are excited to integrate GP PRO’s KOLO system into our smart sensor hydropower faucets and flush valves and, together, connect the entire bathroom ecosystem so as to improve the bathroom experience for facility managers, custodial staff and users alike,” says Shinya Tamura, CEO of TOTO USA. By having a shared interface, building service contractors can easily monitor restroom conditions across multiple dispensers of differing brands to reduce customer complaints and increase tenant satisfaction.